Nitrogen gas can be safely used to package all kinds of foods for long-term storage, shipping, and protect foods from crushing. This process is called Modified Atmosphere Packaging (MAP), and can use Nitrogen, Argon, Carbon Dioxide, or Carbon Monoxide, depending on what food is being packaged. Food gases differ from Industrial gases with respect to the degree of purity and the two should not be interchanged. For some foods, Nitrogen packing is a matter of visual appeal, but for others, it is a critical matter to ensure usability. Coffee Packaging – Coffee goes stale very quickly when it is left exposed to oxygen. One of the things that make coffee so appealing is the volatile oils which produce that heavenly aroma. Once those oils are subjected to ambient air, though, they weaken and change, and the coffee loses not only the power of its signature scent, but the fullness of its flavour, as well. High Moisture And High Fat Foods – To keep food looking and staying fresh for longer periods of time, a Gas Mix containing Nitrogen and CO2 is used. The CO2 prevents bacterial growth in foods, Nitrogen keeps high fat foods more visually appealing. A variety of combinations of the two gases are used in for many vegetable, meat and seafood packing purposes. Dried Snacks – Pure 100% Nitrogen gas is used in packaging dried snacks to replace Oxygen in the packing and keep the snacks fresher, longer. Pressurized Protection – Have you ever wondered why your favourite potato chips arrive in a puffy bag? A Nitrogen gas flush is used in the packaging of delicate foods like potato chips and crackers. This allows manufacturers to ship the food in a “pillow” to prevent breakage, and reduce the risk of Oxygen making the food stale. Stalling Bacterial Growth – Aerobic bacteria, like some strains of Bacillus, need Oxygen to survive. When a food package is flushed with Nitrogen, the Oxygen is driven out, which will prevent the bacteria from growing as long as the package remains sealed. 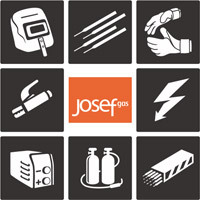 Josef Gas is a supplier of industrial gases and food grade gases including Nitrogen. If you are packaging food in the Greater Toronto Area, we invite you to call us at 416-658-1212 or request a quote online to learn how Josef Gas can supply you MAP gases with superior service and fewer fees than the competition.